As Regenerative Medicine Today celebrates its first anniversary, we welcome back our first guest from December 2005: Dr. Alan Russell, director of the McGowan Institute for Regenerative Medicine. the status of the professional society that serves the scientists who are developing regenerative medicine technologies. In our last two podcasts we learned about the bioengineering and clinical use of artificial heart technology. In today’s podcast, you’ll hear about another approach to treatment for heart failure using lab-grown tissues. Dr. William Wagner is working to reconstruct damaged arteries and veins with scaffolds, and is leading a team that is developing a tissue engineered cardiac patch that could help to strengthen heart muscle that has been damaged by a heart attack. Dr. Wagner also will tell us about his work to improve the interface between artificial devices and the body’s tissues, and about a new imaging technique his lab is working on that could help physicians view whether a transplanted heart has been rejected without performing a biopsy. 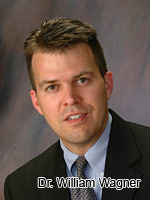 Dr. William Wagner is a deputy director of the McGowan Institute for Regenerative Medicine and associate professor of surgery, chemical engineering, and bioengineering at the University of Pittsburgh. To learn more about Dr. Wagner’s research, please click here. In podcast #15, we’ll meet two researchers with very different approaches to tissue regeneration. We met both at the 2006 Regenerate World Congress in April. 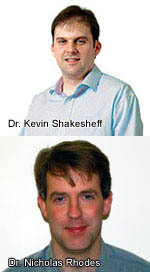 First we’ll hear from Dr. Kevin Shakesheff of the University of Nottingham. He is developing new scaffolds from a familiar material: polylactic acid, the same stuff that makes up absorbable sutures. Dr. Shakesheff imagines outfitting surgeons with a syringe full of polylactic acid that is enhanced with growth factors — or even the patient’s own cells — to inject into an area that needs help to heal. Our second interviewee, Dr. Nicholas Rhodes of the University of Liverpool, would like to do away with scaffolds altogether. Rather than introduce bioengineered materials into patients, he’d rather persuade a patient’s cells to do their own bioengineering. Dr. Rhodes is prompting regeneration by harnessing and directing the body’s natural inflammatory response. In podcast #13, we talk with Professor Jöns Hilborn and Dr. Ivan Martin, two experts in bone tissue engineering who attended the 2006 Regenerate World Congress in April. Professor Hilborn of the Department of Materials Chemistry at Sweden’s Uppsala University is engineering cells to produce customized extracellular matrices, which his lab uses as scaffolds to guide the growth of new bone – eventually for the repair of skull and dental defects in humans. Professor Hilborn’s lab also develops new biomaterials that better match the natural tissues in which they are implanted. Finally, Professor Hilborn discusses the Tissue Engineering and Regenerative Medicine International Society (TERMIS), which he serves as President-Elect. Dr. Martin of the University Hospital of Basel, Switzerland uses a bioreactor – a sort of incubator – to encourage the generation of cartilage and bone. In a clinical trial soon to start, Dr. Martin’s team will seed ceramic particles with patients’ own bone marrow-derived progenitor cells, nurture them inside a bioreactor, then use the material to repair damaged disks in the spine. Dr. Martin hopes to expand this approach so that it can be used to span large bone breaks and defects, and he has an ambitious plan to make affordable bioreactors a standard part of the orthopedist’s toolbox. Each year, approximately 200,000 persons in the United States suffer tears of their anterior cruciate ligament (ACL). Approximately 2/3 of those tears require surgical reconstruction (1/3 at the time of injury and 1/3 at a later time). While orthopaedic surgeons are on the front line to repair tears of the ACL, Dr. Savio Woo and his team at the Muscular Skeletal Research Center (MSRC) are the important partners to the surgeons, developing a fundamental understanding of the function of the ACL and the other components of the knee. Through the eyes of the biomedical engineer, the MSRC is developing a better understanding of the function of the ligaments and the MSRC has identified ways to optimize surgical procedures, and enhance successful outcomes. As you’ll hear in podcast #9, Dr. Woo and his multidisciplinary team makes use of robotics to understand the role of the ACL and the other components of the knee. They are also investigating the use of tissue engineered scaffolds to facilitate the repair of torn ACLs. The attached graphic amplifies on the research strategies and focus areas of the MSRC. To learn more about the work of Dr. Woo and his colleagues, see the MSRC web site. Savio L-Y. Woo, PhD, DSc is the W.K. 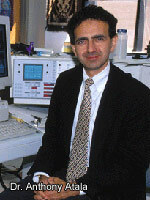 Whiteford Professor, Department of Bioengineering, and Professor-Mechanical Engineering, and Professor-Rehabilitation Science & Technology, University of Pittsburgh. Dr. 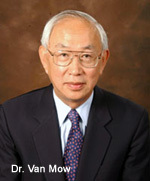 Woo is also Vice Chairman for Research, Mentorship/Internship Program, Department of Bioengineering. Dr. 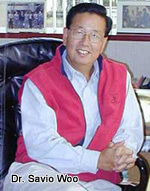 Woo is a recipient of an Olympic Gold Metal in recognition of his untiring contributions to the science of sports medicine. As Dr. Woo details in the podcast, he and his wife have established the “Asian and American Institute for Education and Research” (ASIAM). You can’t make a working synthetic tissue or joint until you fully understand how a natural one functions. That’s the mantra of Dr. Van Mow, who has led the field of tissue engineering decades, and a co-creator of the generalized theory of classical mechanics, which makes it possible to calculate the mechanical loads acting on our bodies as we perform everyday tasks. Van C. Mow, PhD is the Stanley Dicker Professor of Biomedical Engineering and Orthopaedic Bioengineering, and Chairman of the Department of Biomedical Engineering at Columbia University. Fung, Y.C. : Biomechanics: it’s scope, history, and some problems of continuum mechanics in physiology. Appl. Mech. Rev., 21: 1-20, 1968. 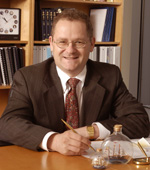 Regenerative Medicine Today welcomes Stephen Badylak, DVM, PhD, MD; Dr. Badylak is a Professor in the Department of Surgery, a deputy director of the McGowan Institute for Regenerative Medicine, and Director of the Center for Pre-Clinical Tissue Engineering within the Institute. Dr. Badylak discusses his research with extra cellular matrix, or ECM. Regenerative Medicine Today welcomes Dr. Alan Russell. 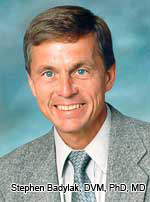 Dr. Russell is the Founding Director of the McGowan Institute for Regenerative Medicine. In this inaugural podcast, he discusses the current state of regenerative medicine and where it is headed in the future.